Cuba is an archipelago of islands located in the Caribbean Sea, with the geographic coordinates 21°3N, 80°00W. 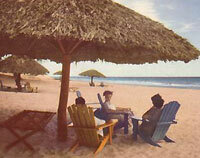 Cuba is the principal island, which is surrounded by four main groups of islands. 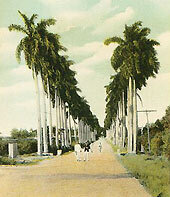 These are the Colorados, the Sabana-Camagüey, the Jardines de la Reina and the Canarreos. The main island of Cuba constitutes most of the nation's land area or 105,006 km and is the seventeenth-largest island in the world by land area. The second largest island in Cuba is the Isla de la Juventud (Isle of Youth) in the southwest, with an area of 3,056 km². Cuba has a total land area of 110,860 km. The Cuba climate is mild subtropical, thanks to its proximity to the Tropic of Cancer, its narrow configuration, east to west oriented receives the refreshing action of trade winds and marine breezes. During the short winter are influences of cold air masses coming from the North, but they are of short duration. The average temperature throughout the year oscillates between the 20 and 35ºC, lowering sometimes to 10°C. The Eastern region enjoys a warmer weather than the western and the variations of temperature between the day and the night are less accentuated in the coastal regions that in inland. Those that enjoy the beach will be glad to know that the average water temperature surpasses 25°C. By its geographic situation, the country is affected between June 1st and 30th November by the cyclone season. They can affect the island in hurricane form with winds that goes up to 200 km/h and heavy storms. A serious hurricane does not come every year by any means, but in the last few years there have been several storms which caused flooding and damage to houses and crops. This cyclone stage agrees approximately with the rainy season (May to October), in front of the dry one (November to April). The experience of a cyclone emergency is a moving but non dangerous fact; all the hotels have modern structure or are rehabilitated and protected to receive the phenomenon. North-East trade winds temper the heat, but summer shade temperatures can rise to 33 °C (Havana), and higher elsewhere. In winter, day temperatures drop to 20°C and there are a few cold days. 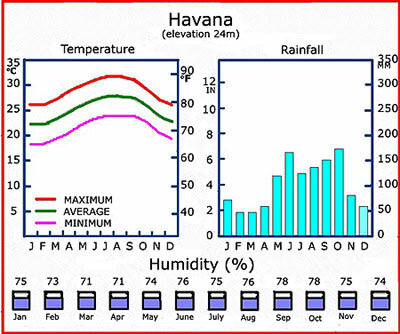 Average rainfall is from 860mm in the East to 1730mm in Havana; it falls mostly in the summer and autumn, but there can be torrential rains at any time. Walking is uncomfortable in summer but most offices, hotels, restaurants an cinemas are air-conditioned. The average annual temperature is about 77 degrees Fahrenheit or 25 degrees Celsius. During the summer season extremes of heat average 81 degrees Fahrenheit or 27.2 degrees Celsius and relative humidity average 80%. The average temperature in winter is about 70 degrees Fahrenheit or 21 degrees Celsius. Annual rainfall averages about 1320 mm (about 52 in.) More than 60% of the rain falls during the wet season, which extends from May to October. The island lies in a region occasionally traversed by violent tropical hurricanes during August, September, and October.